TOMS RIVER, NJ (November 9, 2004) – Passion, dedication, hard-work, motivation, technical ability and enthusiasm are traits that any soccer coach must have in his or her blood to be successful and Tom Gentz, coach of the Jersey Shore Boca 2004 U15 Super-Y-League team has all of the above and then some. Gentz will guide the U15 Jersey Shore Boca SYL team in their quest for a SYL National Championship in the most competitive youth soccer event of the year, the Super Y-League North American Finals, which will be held in Orlando, Florida from November 19-23, 2004. The SYL Finals will determine the league champion of the most prestigious youth soccer league in the U.S. and Canada. 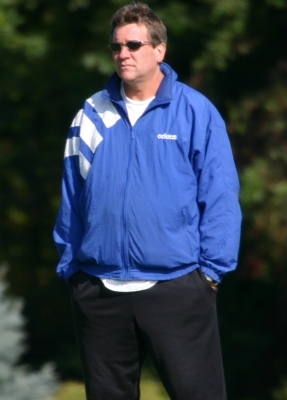 Jersey Shore Boca Coach Tom Gentz will guide the Boca U15 SYL team at the SYL North American Finals in Orlando, Florida. It is the first time in Boca’s four year SYL history that that a Boca team will compete for a SYL Championship. Gentz, who resides in Allentown, New Jersey with his wife Jean and four children, began coaching the Boca U15 SYL team less than a year ago and was determined to make the team champions. Through hard work and dedication, Gentz did just that. He quietly worked both on and off the pitch to make what he envisioned become a reality. Under Coach Gentz, the Jersey Shore Boca U15 team captured first place this summer in the Super Y-League’s U15 Mid-Atlantic Division, which included some of the best 15 year old teams in the nation, with an overall record of 11 wins, 1 loss and 1 tie which guaranteed them a trip to the Finals. His unprecedented style of training and coaching wins the respect and admiration of each of his players. This combined with his ability to push for excellence from the individual player and team is clearly a winning combination. “Training with Coach Gentz has showed me how to play smart and simple. He knows a whole lot about the game and has showed me things I would never think of and how easy it is” mentioned Ryan Nelan, a member of the Boca U15 SYL team heading to Florida. “Most of the time he is real serious and pushes you as hard as you can go but there is still a lot of humor to him” Nelan finished. Gentz, who played his collegiate soccer at the University of Delaware, teaches and preaches a quick, one touch game with smart decisions that requires constant practice and the Boca team doesn’t mind. He instills an intense work ethic, a love of the game and a perfect balance of humor and discipline. “I was a little intimidated the first time I met Coach Gentz, because of the intensity he displayed in his coaching, but I have never met a coach do so much for a team, not only to make them a winning team, but develop them into great players. Thanks to Coach Gentz, my game has improved and keeps getting better. There is never a practice that I don’t learn something” elaborated Luke Calvano another member of the Boca U15 SYL team. “There was a particular practice I will never forget, it was indoor and I will not go into details, but I certainly learned to keep the ball on the ground and hit feet, not other body parts” commented Calvano on the lighter side of Gentz’s training sessions. Gentz likes to keep a low profile and is motivated by the successes of his players. He has trained and coached numerous players during his 18 plus years of coaching including Joseph Sorrentino a two-year member of the Boca’s SYL teams who recently joined the U17 United States Men’s National Team and is currently in residency in Bradenton, Florida. Along with numerous state team and regional team players his successes seem to have no end in sight. Gentz also has the unique situation of coaching one of his four children this year. “My dad always coached me like I wasn’t his son. He treated me the same as everyone else on the team and even though when I was younger I didn’t understand why, but I do now. He knew if he acted like I was different I wouldn’t work as hard, and he treats everyone like that” mentioned Chris Gentz, a member of the Boca U15 SYL team. “He forces all of us to keep working harder and not to settle at our best because we can stretch what our best is” added the coach’s son. The Boca U15s scored 52 goals during the 2004 SYL season while only allowing 14. They were undefeated at home with 5 wins and 1 tie which came at the hands of powerhouse Super Nova FC, the U15 SYL Mid-Atlantic Division runner-up back on July 8th at the Manchester Soccer Complex. The Boca U15 will have their work cut-out for them when they travel to Florida. The U15s, who have been placed in Group B, will face three of the best U15 teams in the United States during the first round of competition, Vardar SC (MI), The Charlotte Soccer Club (NC) and Ajax Orlando FC (FL). The Super Y-League U15 National Finals field also includes powerhouse clubs Super Nova (PA), Storm Academy (NY), Cape Cod Crusaders (MA), and defending SYL National Champion Chicago Magic (IL) among others. “Congratulations go out from our entire club to Coach Tom Gentz and our Boca U15 team. They have certainly earned their spot in the Boca history book. What a tremendous achievement. We are all very proud of them. I’m extremely confident that they will represent our club, our State, their hometowns and their schools as best they can” commented Walt Konopka, a member of the Jersey Shore Boca Board of Directors. “We wish Coach Gentz, all assistant coaches, all team members and all administrators the best of success in Florida at the Super Y-League National Finals” finished Konopka.